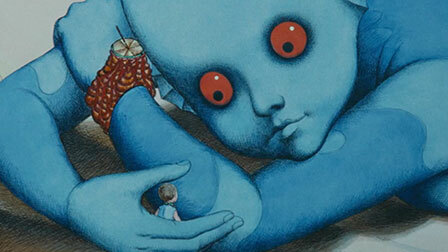 Fantastic Planet explores the idea of human beings being pests in a surreal world. Almost miniaturized to being classified as Earth-bound termites, humans are labeled as “Oms” by the giant blue anthropomorphic creatures, who treat them as pets and play things. The entire film is actually less surreal than anticipated, as it follows a linear narrative. What passes as surreal is mainly the alien world and psychedelic creatures which inhabit it, which reside quite anachronistically, in fact, as clear archaeological artifacts of a time when film goers were stoned; an age where the abundance of leisure bequeathed to the masses is used to devour, harmless though they may be, useless and meaningless sensualities of bizarreness. Here, I criticize the film for pretending to follow in the footsteps of Dali, for the surrealists being advance-guard were not inventing their inconceivable dimensions as mere facades for psychedelic indulgence. In any case, while the surrealism disappointed, the plot did not. It intrigues in exploring an alien-human science fiction concept which is otherwise uninteresting to the mainstream. Human beings struggling in a wild and dangerous environment, with its biggest predators being the blue aliens, develops an examination in how law and order actually spontaneously arises from the wilds within a human society. It is poignant how the film emphasizes the roles of leaders in a society, with leaders rising from merit, from being benefactors to society, to such a degree that any one individual of society could never settle the balance. Also, too, is the latent necessity found among the meritorious to become leaders. It is never questioned, in such a primal state of mankind, whether one actually has a choice, a luxury indeed, of exclusivity between both accomplishment and taking ownership of society. It just is. And so it is with the narrator and main protagonist in the story. He who emerges from being a pet of the blue aliens toward a leader and eventual hero to the human race on that foreign planet. Through his story, it is revealed something noble about this race, which is repetitively demonized by the contemporary self-hating, and that is its eternal struggle for the heights. For reveling in a taste of overcoming. And of providing those gains to a future posterity. Even as the humans steal and act roguishly against each other, they try for a common goal. And that is for a better future for their children. In this sense, the drama and care-free manner in which human lives are shed are so historically resonant with humanity’s own history. Death appears here at such a rapid rate; one is not so much nulled but accepting of its commonplace reality in this wild planet. And yet there is no time to think, no time to answer the higher questions of leisure. For there is no leisure in the first place. It is only bestowed as we find out by the Aliens, whose entire raison d’etre is to sustain it immortally. This too is a noble and lofty goal which the wild humans of their planet will inevitably come to discover. Fantastic Planet, then, is a fantastic examination of the ultimate concerns of being human, and an appreciation of an honest, though unconscientious, desire to perfect. Fantastic Planet explores the idea of human beings being pests in a surreal world. Almost miniaturized to being classified as Earth-bound termites, humans are labeled as “Oms” by the giant blue anthropomorphic creatures, who treat them as pets and play things. The entire film is actually less surreal than anticipated, as it follows a linear narrative. What passes as surreal is mainly the alien world and psychedelic creatures which inhabit it, which reside quite anachronistically, in fact, as clear archaeological artifacts of a time when film goers were stoned; an age where the abundance of leisure bequeathed to the masses is used to devour, harmless though they may be, useless and meaningless sensualities of bizarreness. Here, I criticize the film for pretending to follow in the foot-steps of Dali, for the surrealists being advance-guard was not inventing their inconceivable dimensions as mere facades for psychedelic indulgence. And so it is the narrator and main protagonist of the story. He who emerges from being a pet of the blue aliens toward a leader and eventual hero to the human race on that foreign planet. Through his story, it is revealed something noble about this race, which is repetitively demonized by the contemporary self-hating, and that is its eternal struggle for the heights. For reveling in a taste of overcoming. And of providing those gains to a future posterity. Even as the humans steal and act roguishly against each other, they try for a common goal. And that is for a better future for their children. In this sense, the drama and the care-free manner in which human lives are shed are so historically resonant with humanity’s own history. Death appears here at such a rapid rate; one is not so much nulled but accepting of its commonplace reality in this wild planet. And yet there is no time to think, no time to answer the higher questions of leisure. For there is no leisure in the first place. It is only bestowed as we find out by the Aliens, whose entire raison d’etre is to sustain it immortally. This too is a noble and lofty goal which the wild humans of their planet will inevitably come to discover. Fantastic Planet, then, is a fantastic examination of the ultimate concerns of being human, and an appreciation of an honest, though unconscientious, desire to perfect.